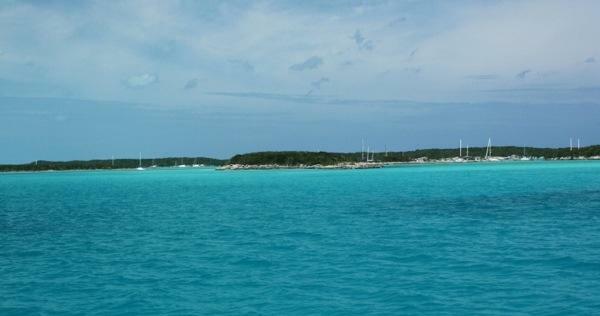 We’d traveled to Great Exuma Island where our destination was Georgetown. Not only were our friends aboard Por Dos at Georgetown, but here we’d also be able to re-provision, re-fuel, and find a cozy nook for an approaching cold front. 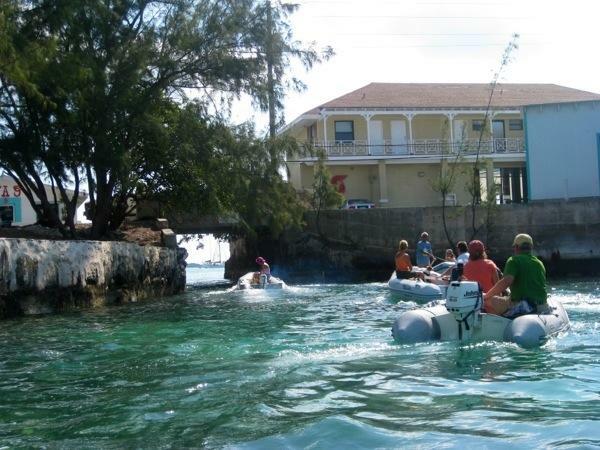 We’d heard rumor that Georgetown has become populated with cruisers during winter months; 300 boats supposedly there. We weren’t sure just what to expect but we knew it would not be a quaint getaway. Sure enough when we arrived we found three anchorages all packed to the gills with boats. Our plan was to anchor at Kidd Cove, nearest town. This would enable us to easily re-provision. Then we could contact Por Dos on the VHF and move to their location. They share our liking of avoiding crowds so we knew they’d be in a great spot. That night we marveled at the skyline of mast lights which looked like skyscrapers, realizing that the island behind them has no town, no buildings. It was quiet and calm. We reminisced about Newport, RI where there was music playing from shore and dinghies zipping around. We thought it odd to be this quiet on a Friday night with this number of boats, but then cruisers midnight does come at 9:00pm. The next morning, hearing an announcement for the Georgetown Net on the VHF, I switched to channel 72 to listen. This is a daily Net that provides information such as: weather, announcements from local businesses, daily activities, tomorrow’s activities, boaters’ general, safety & housekeeping, and arrivals/departures. There are many, many Canadian cruisers here in the Bahamas and at Georgetown, so a portion of the Net is French announcements. Can’t say I blame them wanting to escape Canada’s winter season. Listening I was intrigued because I suddenly realized that we’d landed at the paradise version of Brooksby Village! I asked Brian, “would you like to play Pinocle this afternoon, or should we head over to the beach for yoga followed by a walking tour?” We stuck to our game plan and after the Net headed ashore for groceries and fuel. 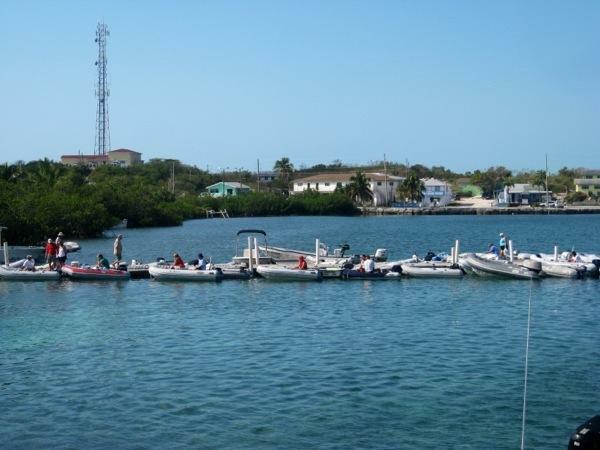 Busy, busy at the dinghy dock! People were waiting in line near the water hose for free, drinking water. The grocery store was on the street at the end of the dock. We found fuel at the neighboring Shell station and filled our jerry cans. Never thought I’d be in a dinghy traffic jam. 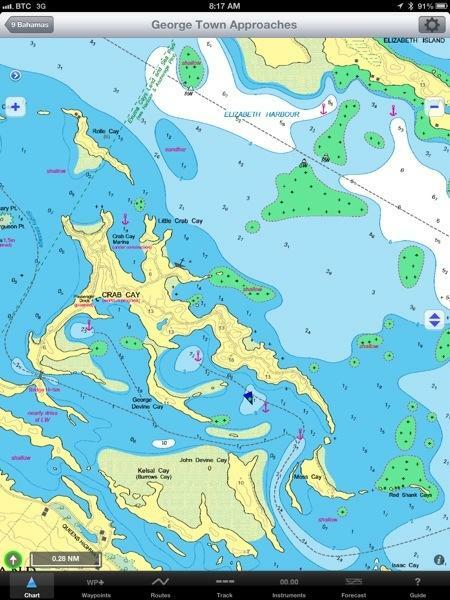 After our errands we connected with Por Dos and made our way toward the Red Shank Cays on the south side of Crab Cay. There was a bit of visual navigation required as we had to avoid coral heads. We’d planned our move at high tide so we’d have appropriate depth to tuck behind these islands. Below I’ve got a chart view, our location is the blue triangle. 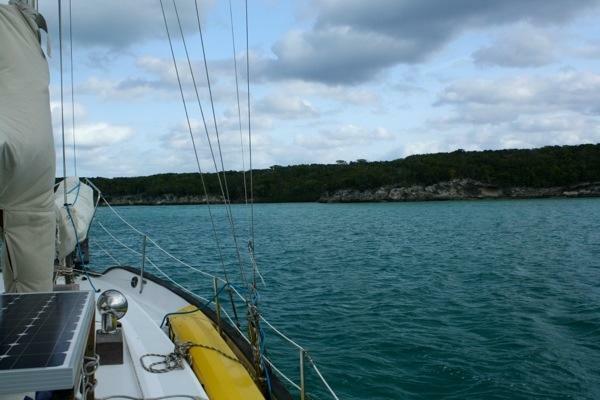 We entered from the east where you can see a course line rounding below Red Shank Cays. Below the chart I have a photo of our view on approach. We’d made it inside and anchored successfully. Here is our starboard view, and our port view of the neighboring cove where Por Dos was located. Time to go play with our friends! Hooray! 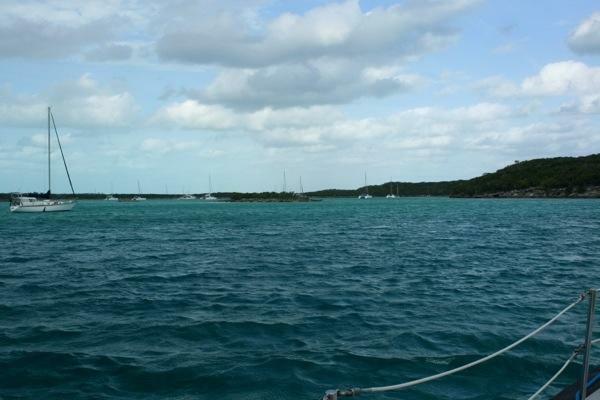 This entry was posted in Uncategorized and tagged 20130215, Georgetown, Great Exuma Island by stephanie. Bookmark the permalink.